BT is replacing London payphones with new units providing "ultrafast" internet as well as free phone calls and ad-serving digital screens by Primesight. The first of the new InLinks units have appeared on Camden High Street today, with the InLinkUK from BT service rolled out to other London high streets and UK high streets later this year. BT said the units will have internet speeds of up to one gigabit per second, making it the fastest free public Wi-Fi service available. They will also include free UK landline and mobile phone calls, mobile device charging as well access to maps, and a BT Phone Book app. The digital displays will feature real-time information, such as travel updates, and weather forecasts, as well as serve ads. BT said all InLink services are free to use because the project is funded by advertising revenue generated by the commercial messages displayed on the screens. 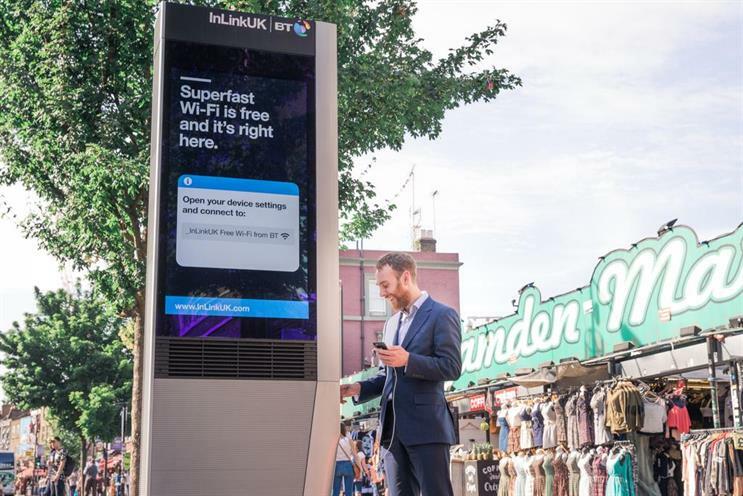 Naren Patel, chief executive of Primesight, said: "As London continues to develop as a smart city, the launch of the InLinks will provide a real value exchange between consumers and brands. "Consumers will see relevant content from brands on the screens and use the free services provided, and in turn brands will benefit from being associated with a product that will provide real benefits to the people in the communities. "It’s a fast, smart, ad-funded product that is set to benefit consumers and advertisers alike."